Waiheke, Maori for ‘cascading water’, was named by European seamen who replenished their water supplies here, but the Maori occupants called it Te Motu Arai Roa, or ‘long sheltering island’. 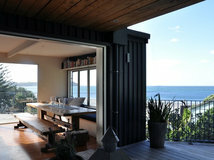 It is just 20 kilometres from Auckland’s city centre and a short ferry ride across the Hauraki Gulf. 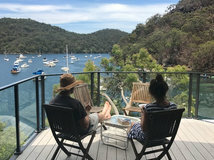 As well as being home to permanent residents, the island is a popular venue for holiday homes, enjoying more than 100 hours a year more sun than Auckland. 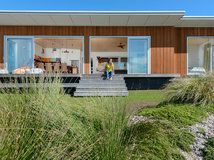 The steep slopes, dotted with vineyards and olive groves, are fringed by white sand beaches and it’s overlooking one of these, Oneroa, that Ian Davidson and his wife Louise decided to create a holiday house for their extended family, a gathering place for good times in the years to come. 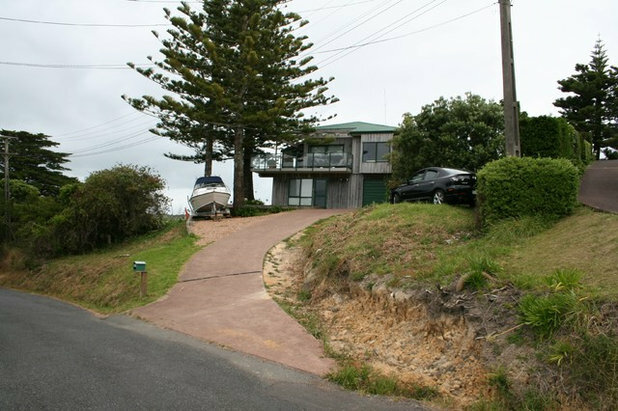 In 2011, the Davidsons purchased a run-down cottage that had occupied a hill looking towards Oneroa Bay since the ’90s. 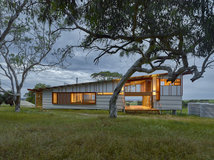 They immediately began planning changes to turn it into a relaxed and flexible family holiday home. 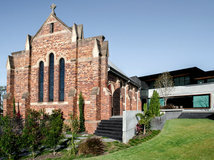 A plan was drafted and Resource and Building Consent completed by early 2012, but the Davidsons were not yet convinced they were on the right track. 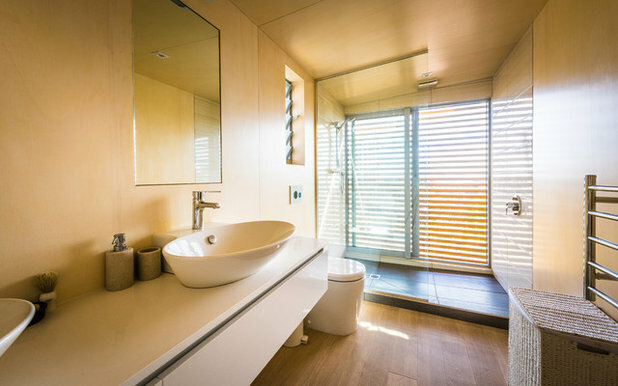 Architect Charissa Snijders was called in to help in 2012, quite late in the project. 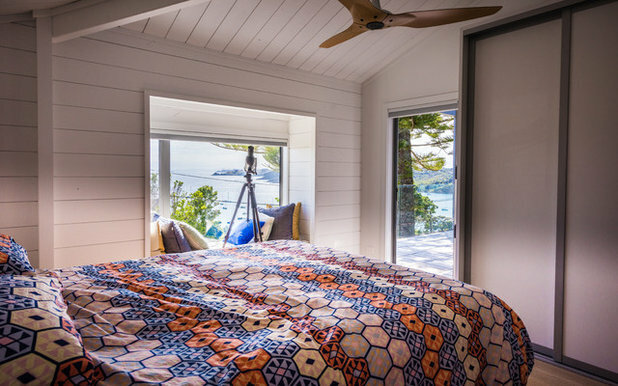 “The Davidsons described their vision as ‘a home that celebrated family and was willing to take the knocks of daily life and young children and pets roaming freely’,” says Snijders. 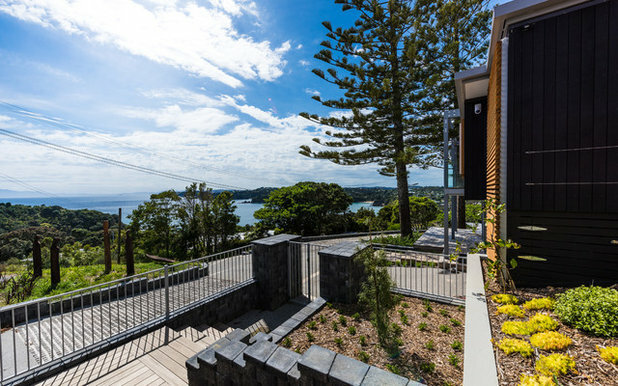 In order to deliver this on a steep site with beautiful views of the gulf and the mainland, she says, “I realised I couldn’t just do a makeover on the exterior, but would have to also address the internal design.” Work came to a halt while plans were redrawn, and recommenced in 2013. “From the first, Louise and I worked well together. She was a creative and inspiring person, an actor, interior designer, nationally recognised fabric artist, and someone who lit up the room,” Snijders adds. However, shortly after construction based on the new design began, Louise was diagnosed with cancer and died in September 2013. 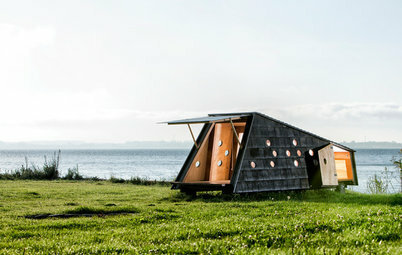 “I don’t believe she returned to the site, but the house is very much a tribute to her ideas and commitment,” says Snijders. Five carved wooden posts stand on a slope beside the house. They are Maori ‘pou whenua’, which traditionally mark boundaries or places of significance. 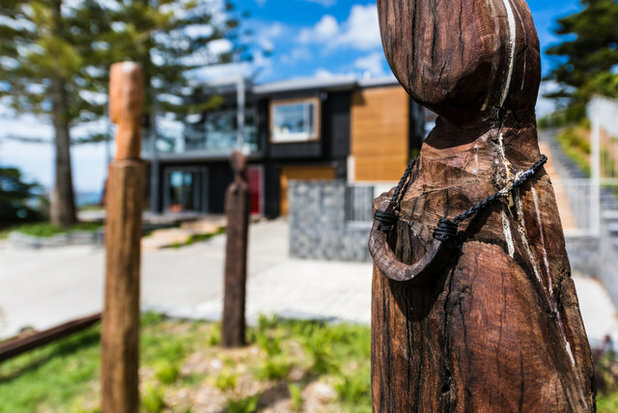 These were made from recycled jarrah by Waiheke sculptor Anton Forde and depict two male and three female forms. The waka, or canoe, in front of the pou, was fashioned from a recycled power pole from the island. “It represents our ancestors who came to New Zealand by boat many years ago,” Davidson adds. Externally, extensive landscaping was necessary to bring the approaches to the house in line with its new modern demeanour. 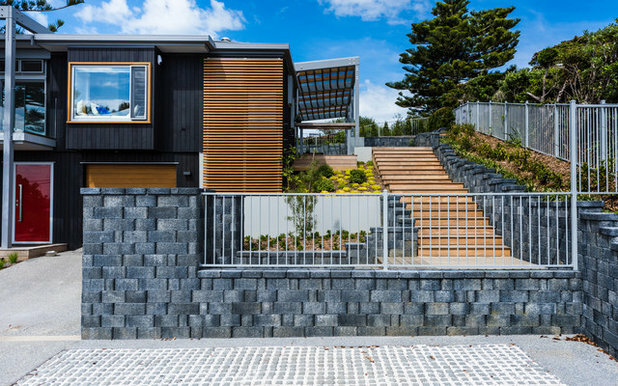 With Snijders’ involvement, the driveway was upgraded, new brick retaining walls built and garden beds established with salt-hardy and low-maintenance vegetation, to withstand the sunny conditions and proximity to the ocean. 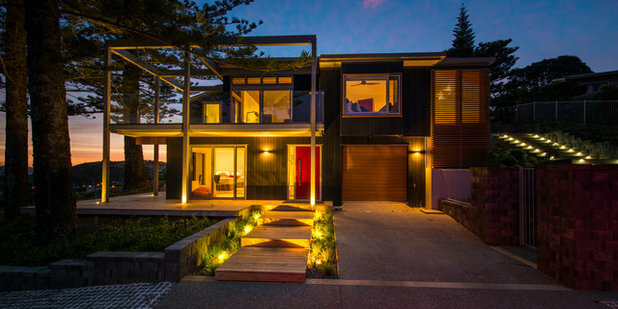 Exterior lighting enhances the plantings that hedge the unstained timber decking leading to the front door. 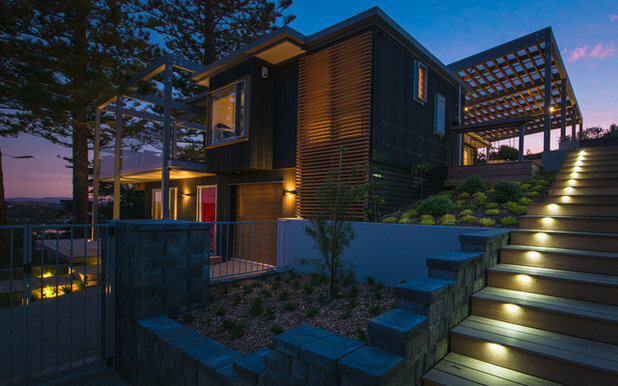 A flight of timber steps, with under-tread lighting, runs beside the garden and leads to the outdoor deck areas at the rear of the property. 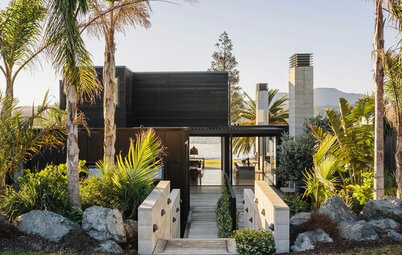 Snijders has adhered to a palette of subtle greys and natural timber to give the exterior connection to the superb natural setting. Cedar shiplap replaced the existing worn boards, finished in Resene Woodsman oil in ‘Shadowmatch‘. The posts and beams, roof, fascia boards and gutters were painted in Resene’s ‘Sandstone Grey’, aluminium joinery is in ‘Silver Pearl’ from Franklin Aluminium. The cedar screens, pergola rafters and garage door are all finished in Resene’s ‘Natural’ Woodsman oil. Well-functioning and spacious outdoor living areas were a priority, to fit in with the sunny orientation, lovely views and planned large family gatherings. Timber decking in Garapa, a South American hardwood, encircles two sides of the property, defined by a striking pergola structure. 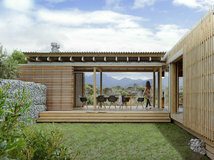 Because of the slope of the site, this decking can be accessed from the living areas in the upper floor of the house. 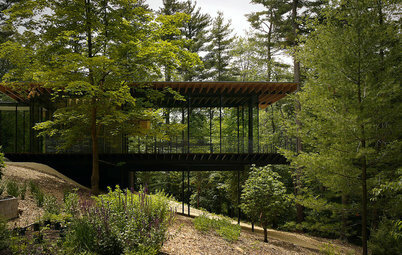 Floor plans and elevations show the extent of the outdoor areas that were added to the house. 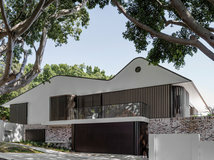 They also show the sloping site that enabled Snijders to integrate them with the indoor areas, and which allows access from several points around the house. 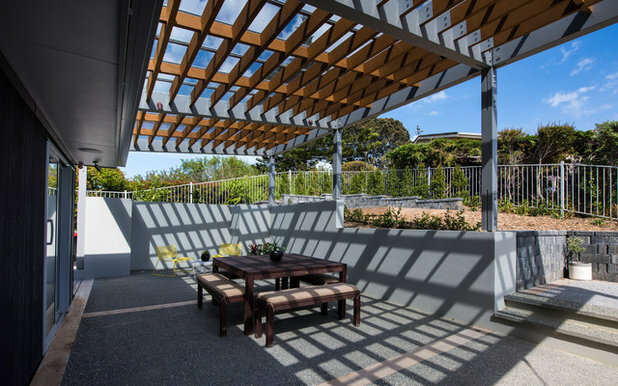 A more sheltered space at the rear of the house serves as an outdoor dining area. It is covered with PSP Clearvue grey-tinted perspex roofing, and enclosed by a plastered concrete wall in Resene’s Quarter ‘Tapa’. 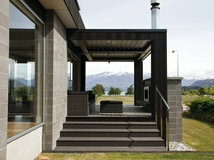 The flooring is black oxide pebble-mix concrete aggregate with inlaid strips of totara, a native timber. 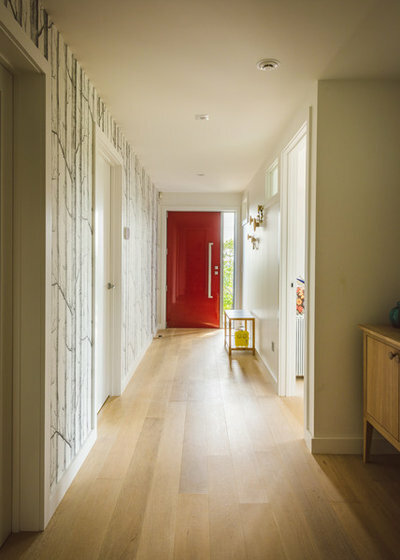 The entrance hall, accessed through a bright red door, is lined with a graphic wallpaper featuring sketches of tree trunks. Floors throughout are oak finished with white wood oil from Danish company Woca. 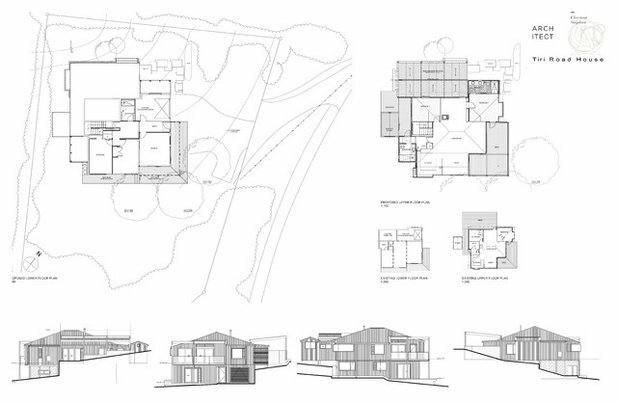 The lower level of the house contains a bedroom, bathroom, utility rooms, garage, storage and an outdoor space. Michael Clark (1959) ‘Woods’ wallpaper in black and white: Cole & Son. 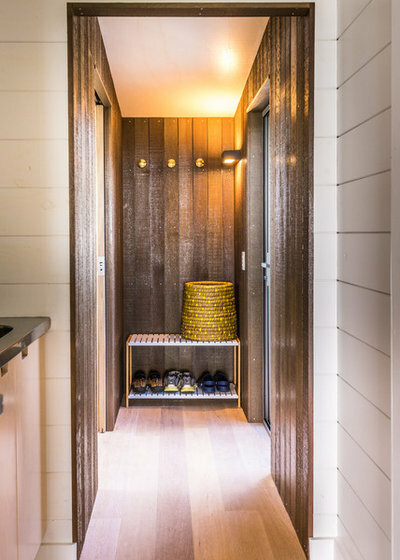 A small timber-lined rear interior porch, used for storing sandy shoes and outdoor clothes is painted in ‘Smokey Ash’ by Resene. 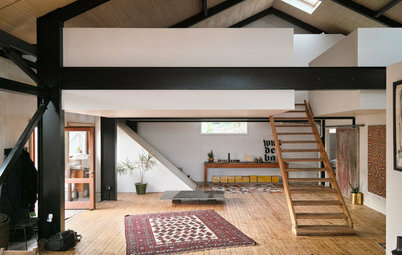 Internally, changes to the layout centred around relocating an internal staircase from its position on the original plan. 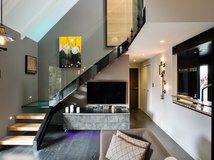 This staircase leads to the upper level of the house, which contains extensive indoor and outdoor entertaining areas, another bathroom and bedroom, master bedroom with ensuite, and open-plan kitchen and dining. For Snijders, the staircase relocation was the crux of the whole project, allowing integration between the upstairs and downstairs levels. 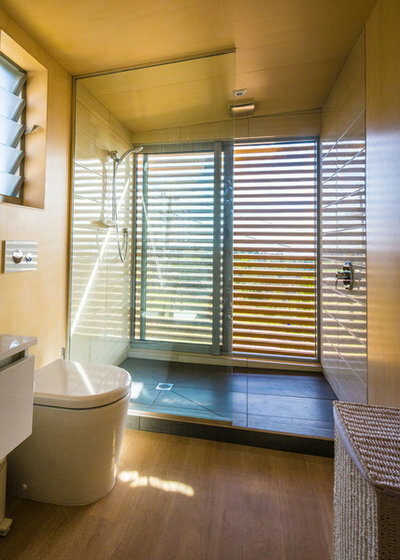 Existing bathrooms were re-positioned and an ensuite for the master bedroom was added to the plan. Louise’s father was Danish and had given her an embroidery artwork, which she treasured. “She wanted to take the colours and feel of this work and bring them into the house,” says Snijders. The cool Scandinavian feel of the home, with its white walls, pale timber and simple but comfortable furniture, is a reflection of the intensive collaboration between Louise and Snijders. “We slowly but surely touched every surface through conversations and pen until we brought the couple’s dream into being,” says Snijders. 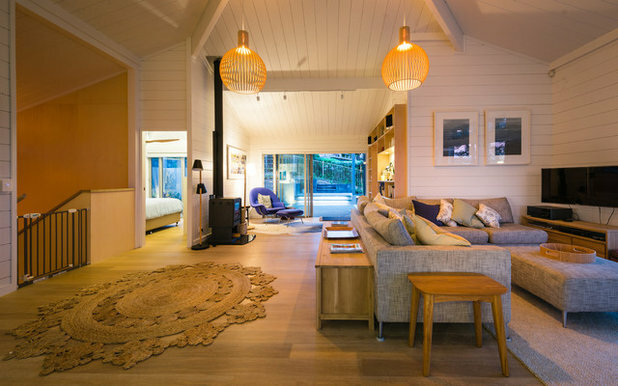 The living space was reconfigured to comprise two separate but open areas. 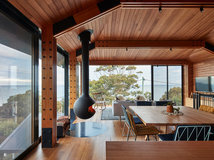 One has a built-in bookcase and fireplace, the other, seen here, is more connected to the views and the deck outside. Doorways were widened to facilitate movement to and from the deck. The bookcase is hoop pine finished in Osmo Polyx Hardwax from Natural House Eco. 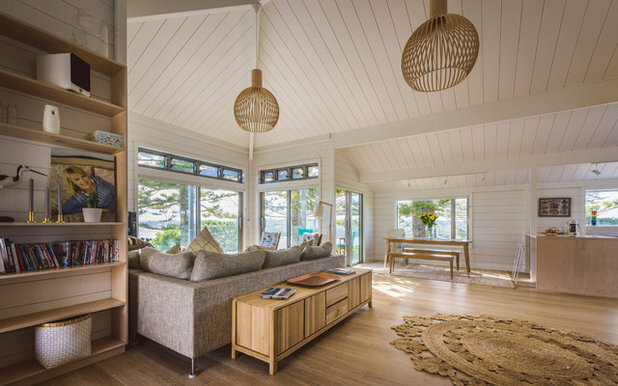 The tongue and groove ceilings and walls are in Resene’s Quarter ‘Sea Fog’. 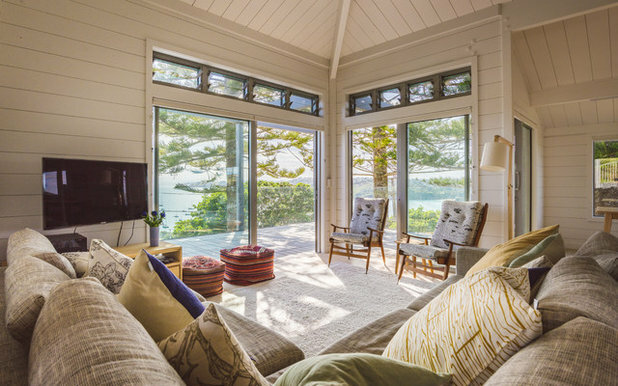 A bank of high louvred windows was added above the doors of the living space, to bring more light inside and provide more ventilation. The home has hosted several pre- and post-wedding functions and the seamless flow between the living spaces and from inside to out has proven to be perfectly suited to large gatherings. Mid-century-style chairs are covered in Hills of Home fabric in ‘Ivory/Asphalt’ by Hemptech. The dining area is positioned to take full advantage of the views. Furnishings are stylishly simple, in the Scandinavian style loved by Louise, with roomy sofas, blonde wood cabinetry and a dining table with bench seating. 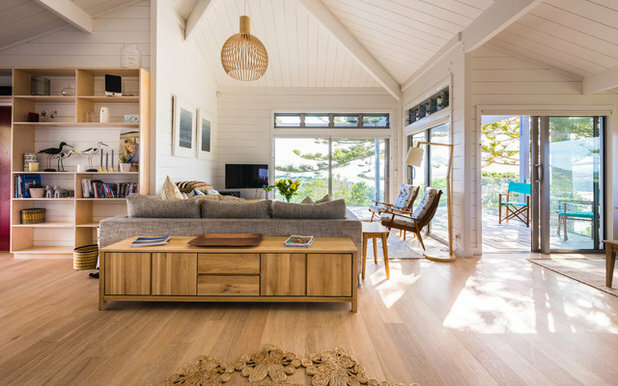 A wide bench in hoop pine ply, with a blonde polyurethane finish, separates the kitchen and living areas. This also doubles as an informal dining area. 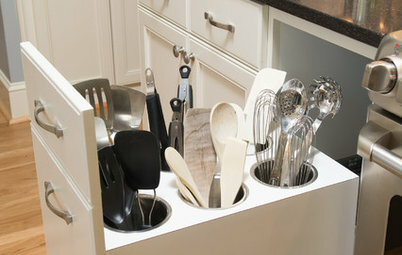 The kitchen was designed for casual ease of use for all the family. “Louise loved the simplicity and harmonious feel of the pared-down colours, white walls and ceilings with natural oak floors,” says Snijders. 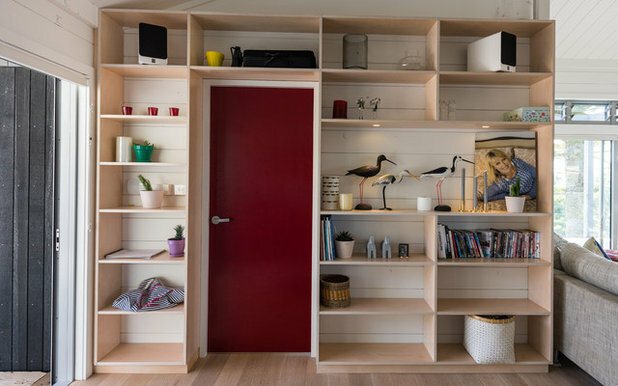 The under-bench cabinetry – and the internal doors – is Plytech Spectrum Eco, a pre-finished birch plywood in red with a transparent topcoat. 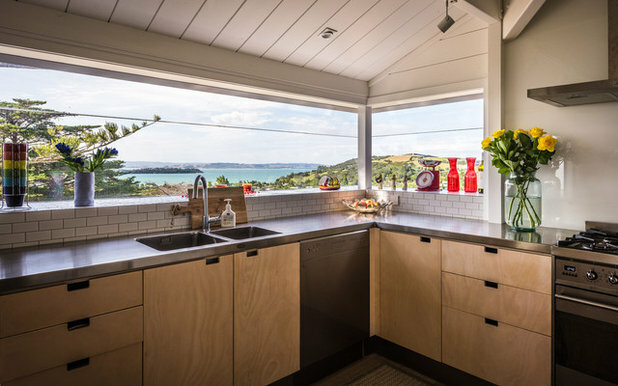 The open kitchen enjoys fabulous views across Waiheke’s hilly landscape, to the ocean and islands. 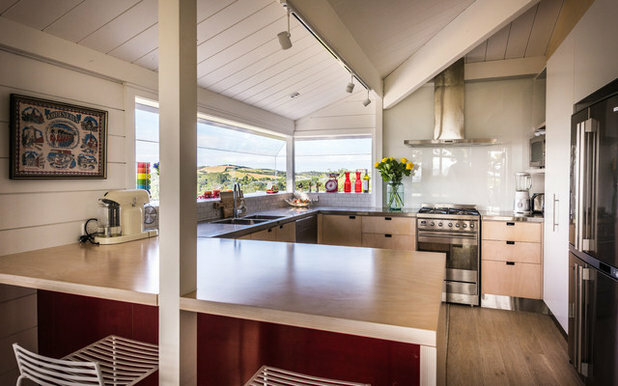 Kitchen joinery is hoop pine ply to match the bench, and benchtops are stainless steel with integrated sinks. 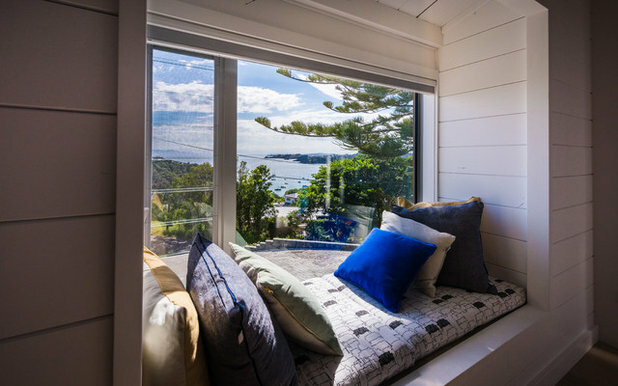 The three bedrooms in the house stayed in their original positions, but were upgraded with new joinery, lighting, ceiling fans and white painted timber walls. The master bed upstairs is covered in a quilt from Kip & Co.
An ensuite was added to the main bedroom. 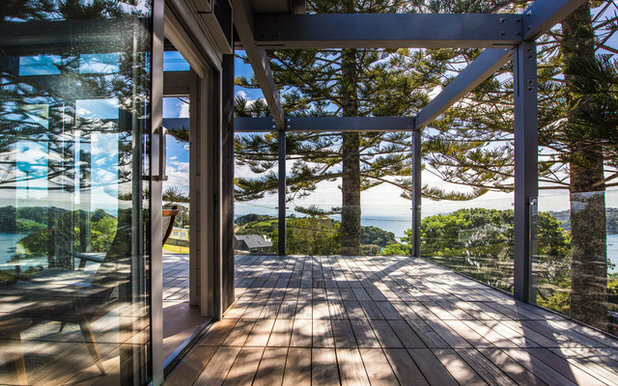 A screen of cedar battens ensures privacy without impeding the view. 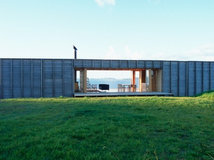 This screen also extends the height of the house and is a striking feature from the exterior. 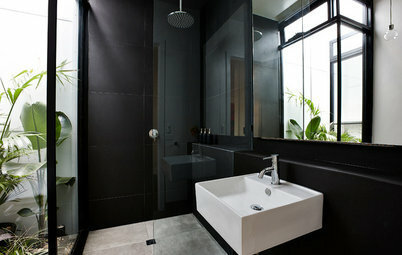 Shower floor tiles are Magma Grey Natural, a cool basalt grey, from Heritage Tiles. 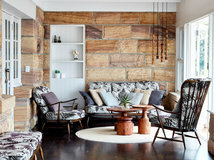 The walls were tiled in Zen Maril tiles in off-white, from Porcelanosa Tile Co. Despite the family’s loss, Ian Davidson persevered to complete Louise’s vision. It took great strength and courage for him to continue, and take a more active role in the decision-making, says Snijders. Absolutely breathtaking!!! Incredible use of texture, materials and angles. Definitely one of the best overall blended integration of out space and elevation balance! 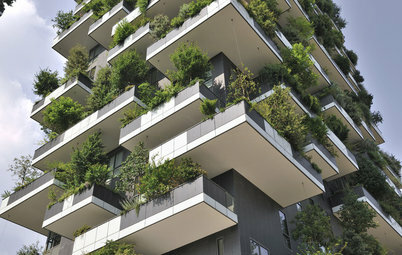 The architect was - is - a genius!! Lucky people to have found him! Foundations How Will Your New House Meet the Ground?